If you're relying on click-through rates to measure your brand's mobile ad performance, you may not be getting an accurate picture of which ads are truly working. The click-through rate (CTR) has long been held as the default measurement to determine a campaign's effectiveness, but it can miss key information like brand awareness, engagement, and intent—especially on mobile, when accidental taps account for 50 percent of impressions, according to Google. Moreover, CTR appears to be unrelated or even negatively correlated with other important actions brands want consumers to take after viewing an ad, like calling, mapping directions, or visiting the store, xAd found. Simply put, mobile is different from desktop. Users interact with mobile devices in highly personal ways throughout their day in a variety of contexts. Taps aren't the only behaviors marketers want to encourage through their ad campaigns. Consider these four alternative metrics to help measure effective mobile ad performance. Viewability, Secondary Actions, Dwell Time, and Brand Lift should all be considered for mobile campaigns. Viewability is a metric that shows whether a digital ad was actually viewed by a human user. Measuring viewable impressions reveals how many times an ad was seen, which helps marketers understand the impact of their campaigns. After all, even if users don't click or tap the ad, the content they see might drive actions later (like a website visit, brand search, or an in-store visit). Viewability is an especially useful metric for mobile, where ads may not technically be "viewable" at all times. Display ads are considered viewable only when 50 percent of the ad pixels are viewable for at least one second, according to the Media Rating Council. So ads that take too long to load, aren't visible for at least one second as a user quickly scrolls, or are buried below the fold may not be "viewable" to a user on the page. That's important because viewability is highly related to ad effectiveness, according to research from IPG Media Lab. The greater the visibility and exposure time of the ad, the greater the consumer attention and ad recall, the study found. While viewable impressions shouldn't necessarily replace CTR, viewability is a tool you can use to measure how well different mobile ad formats are working. Secondary actions reveal the actions users take after they see an ad beyond a mere tap—this could be clicking to call, accessing a map or driving directions, or sharing content to Facebook. Tracking these metrics may be particularly revealing on mobile, when users are often searching for information about a business on-the-go. Marketing Land notes that xAd's study of click-through rates revealed that optimizing for CTR had a negative effect on secondary actions, especially in the retail sector, where it was down 69 percent. When optimizing for secondary actions, however, CTRs were down somewhat, but secondary actions were up as high as 219 percent. You may want to consider optimizing your campaigns around secondary actions rather than click-through rate. Some mobile ads may not generate a wealth of clicks, but they are effective at getting users to "dwell" on the ad content. Mobile ads with a high dwell time may signal that the content is especially relevant for the targeted users. Users may be spending time interacting with a native ad by watching a video, playing a game, or reading sponsored content. In these cases, counting clicks won't measure the engagement occurring. Marketing Land notes that a Yahoo Labs study discovered that optimizing Yahoo recommendation algorithms around dwell time rather than CTR yielded gains in both, suggesting that you don't need to optimize solely for CTR in order to see increases in clicks. Mobile ads can generate increased brand awareness even if they don't generate clicks. For example, an ad campaign may boost organic searches on Google or increase direct website traffic. And, as BrightRoll notes, brand lift can be measured at various stages in the funnel, including the initial awareness stage all the way to brand preference and conversion. The more effective the ad, the higher the search and web traffic for your brand. Brands may also notice an uptick in users viewing more pages on their websites and completing more actions, like filling out forms for gated content. Because users have a variety of ways to interact with ads on mobile devices, CTR doesn't tell the whole story. Utilizing a variety of metrics can help you better understand how effective your mobile ads are at driving specific actions beyond mere clicks. 1. 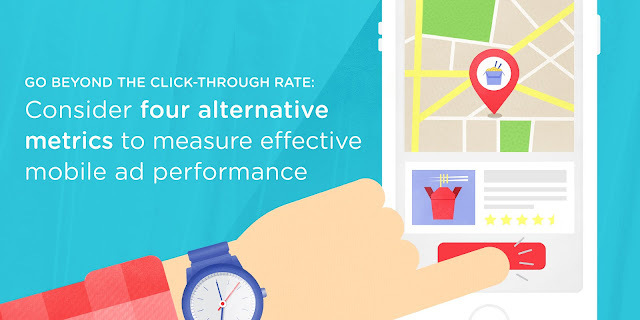 Click-through rates may be poor indicator of mobile ad performance. 2. Utilizing multiple metrics can reveal a more nuanced picture of mobile ad effectiveness. 3. Mobile ads may drive other important actions beyond clicks.